This is the Pro Fishing Challenge VR support team. Thank you for playing Pro Fishing Challenge VR. If you are experiencing a bug or any kind of problem in game, please provide a description of the problem or bug and send an e-mail to the following address below. Today, we want to announce our latest updates! 1. We knew that we had to tweak the behavior of fish. Behavior of fish has now improved. We will continue improving on the fish behavior to replicate a real world fishing experience in VR! Spring, Summer, and Autumn are now available in “Small Lake”! Graphics quality has been improved too. Check it out and see the difference! We are constantly working on ways to improve Pro Fishing Challenge VR in all kinds of areas. Look for more updates and additions in the near future. Author pfcPosted on Tuesday December 26th, 2017 Friday February 23rd, 2018 Categories Release NotesLeave a comment on beta2.3 Release! In this update, we’ve fixed the tournaments section and it’s now available again. Check details from the link below. Also,all players can now check your records in the game. Check the tablet and press “Activity” through “Player” button to see it! Author pfcPosted on Monday October 2nd, 2017 Friday February 23rd, 2018 Categories Release NotesLeave a comment on beta2.2 Release! Did you know that Pro Fishing Challenge VR now has online tournaments? credits and experience in game. What is the Daily tournament? It’s a tournament held 3 times a day. 3 tournaments in a day. so everyone can enjoy it. Catch as many of the target fish for the tournament as possible. The time limit is 15 minutes. You’ll compete by the total weight of the fish you’ve caught. If you’re ranked in the top 10, you’ll win credits and experience in the game. It’s a tournament held once a week. Each tournament will be held for a whole week. Rank tournament will be available when you reach level 10. It’s for anglers getting used to the game. In this tournament, anglers will be separated by their rank, which is defined by their score in the tournament. Your rank changes according to your score. so it’s easier to compete with a player who ranks with you. There are 5 different ranks and you win a larger prize as you get to a higher rank. You are allowed to challenge 4 times during the tournament. score will be determined by the total weight of the target fish you’ve caught. You can win a prize if you rank in the top 10, but you must also rank up and increase your score so that its high enough to move on in the tournament. The scoring judges whether your rank goes up or down. There is a low score and a high score. If your score is higher than the high level marker, your rank goes up. If your score is lower than the low level marker, your rank goes down. If your score is between the marker, your rank doesn’t change. Also, if you pass each level marker, you win credits and experience. You don’t have to rank in the top 10 to win prizes. so you have to play the pre-tournament to get your first rank. Beginner, Angler, Pro, will be rewarded according to your score. If you’re going to try fishing in an given lake. You can only try it once and the time limit is 15 minutes. You are judged by how many fish you’ve caught in the tournament. Author pfcPosted on Monday October 2nd, 2017 Friday February 23rd, 2018 Categories TournamentsLeave a comment on Let’s join Online Tournaments! 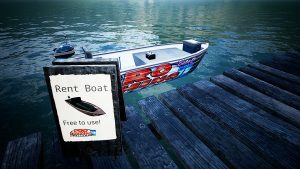 In this update, we’ve added a rent boat for Fall Bridge Lake. It’s completely free to use, so have fun! everyone can have a great experience through Pro Fishing Challenge VR. 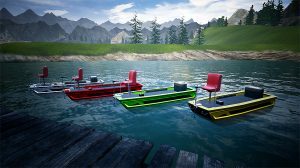 – Color of the boat changes in multi-player mode to recognize your boat easier. Author pfcPosted on Tuesday August 29th, 2017 Wednesday August 30th, 2017 Categories Release Notes1 Comment on beta2.1 Release! This update brings a complete overhaul of the tutorial. It can be started from the new title screen, make sure to check it out. A new microtransaction shop was placed on the second floor of the lodge. Many new items and goods are waiting for you!